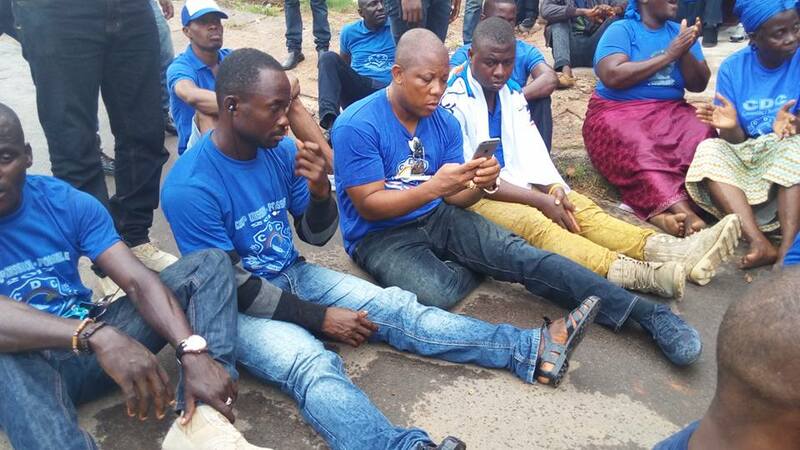 For three days and three nights the youth wing of the Congress for Democratic Change (CDC) staged a hunger strike opposite the US Embassy in Monrovia, Liberia. The group carried out the strike to protect corruption in Liberia in wake of the Global Witness report of bribery in Liberia. The strike started on June 1 to June 3, 2016. CDC is the largest opposition party in Liberia. The Global Witness report alleged that Sable Mining Company, a British firm, gave Varney Sherman of Sherman and Sherman Law Firm US$9500,000 to bribe some government officials, including Alex Tyler, Speaker of the House of Representative, the former Minister of Lands and Mines and the previous chairman of the National Investment Commission to help change the Liberian procurement and concessions law to favor Sable Mining, which was not a registered company in Liberia, to mine the Wologizi iron ore concession in Liberia. According to Global Witness, the bribery scheme started in 2010. Sable Mining wanted to win the mining concession contract for Wologizi iron ore, after the company‘s investors under a different business name, had lost a previous contract bid in Liberia. Sable hired Varney Sherman of Sherman and Sherman Law Firm to help them in this effort. Sherman advised Sable that in order to achieve this, the country’s procurement and concessions law should be changed in favor of Sable. This process entailed bribing key government officials to approve the change. The report stated that Sable gave Sherman the US$950,000 to carry out the bribery. Sherman is said to have given, for example, US$75,000 to the speaker, US$50,000 to Morris Saytumah, Minister of State for Finance, Economic and Legal Affairs, and US$50,000 to Richard Tolbert, Chairman of National Investment Commission. Saytumah is now a senator and Tolbert is retired from the government. Sherman is the chairman of the ruling Unity Party, a seasoned and well-connected lawyer in Liberia. Global Witness also alleged that Sherman gave $250.000 each to “Big Boy 1 and Big Boy 2”, faked names which the report said Sherman gave to hide the real names of the individuals in the government who received the amount. Global Witness said Sherman mentioned those faked names in a spreadsheet prepared by him or his law firm giving account of the money to the company in an email. Sherman, in addition to his position as party chair, is now also senator from Grand Cape Mount County in Liberia following the 2014 special senatorial election. The senator and the speaker were arrested late May this year and are on bail. But they would not for the sake of professional ethnics, recluse themselves in the legislature while the case is pending. The lower court has subpoenaed the bank records of the accused, but Sherman legal team has appealed to the Supreme Court against the subpoena. Moreover, the house has recently appointed a committee under the leadership of the speaker to investigate the corruption/bribery saga, an indication of the “accused serving also as the judge”. Meanwhile, the CDC party is said to have asked its legislative partisans to protect sitting in chamber under Tyler gavel. The action by the house to investigate is in addition to the Special Task Force appointed by the president to investigate and prosecute those allegedly involved. The Task Force is headed by the Minister of State Fonati Kofa, who is an ex-convict in America when he was residing there. Before his appointment as a minister, he was the chairman of the Liberty Party, another opposition party in Liberia. Opponents to Kofa’s appointment to head the Task Force maintain that he lacks the moral ground to lead the team and that the case should have been given to the Liberian Anti-Corruption Commission (LACC), a statutory body or to an independent prosecutor not appointed by the president. They argue that as a presidential appointee, he would be unable to strongly investigate the presidency if the president is found to be involved in the bribery. The speaker too holds the latter view and he and Sherman have refused to appear before the Task Force. The speaker has indicated that the president approved changing the procurement and concessions law. However, others supported the appointment and praised the president for taking a bold step on corruption. To them the president is tired of corruption and the failure of established agencies to successfully prosecute. Despite Koffa’s past problem, they say that he is a good and competent lawyer and is not afraid to take legal actions. But last Thursday, June 3, Minister Kofa announced at a press conference that the case has been turned over to the justice ministry and that the Task Force will now play a supportive role in the matter. Many Liberians are disappointed regarding the announcement. They view that the case will die in the justice ministry, pointing out that the newly appointed Justice Minister, Frederick Cherue, is a very close friend of Sherman, who recommended him to the post. The concern of conflict of interest was raised at the conference, but the minister played down on the issue. Another concern is that Solicitor General Betty Blamoh of the justice ministry was a lawyer at the Sherman and Sherman Law Firm. She is said to have worked on the Sable deal during her work with the firm. Accordingly, Varney Sherman provided her with her first job as a lawyer. Will she and the minister recluse themselves? Global Witness is a well-known and credible international advocacy entity. If the state loses this case, it would hurt the president. Although her term will expire January 2018 and she is not eligible for re-election, failure to successfully prosecute the case would affect her legacy and her international image. The hunger strike called for government officials indicted to recluse themselves from their official positions while the case is pending. The group also asked that the US Embassy not to grant those accused travel visa or entry authorization to America during the case and for the US government to freeze any asset or bank account in the US of those indicted until conclusion of the case; and to take a firm position on corruption in Liberia, considering US historical role in the country. Corruption also hampers development and causes poverty in Liberia, as some observers have pointed out. On the last day of the hunger strike, Joe Chamberlain, Political Affairs Officer of the US Embassy, walked in the rain to receive the group two-page position statement. He thanked the CDC youths for their peaceful, orderly, and well-mannered assembly. He informed that the group’s recommendations or positions would be forwarded to Washington for consideration for implementation. He said: “I applaud you for this. As I said, I will report this back to Washington – to the extent that your recommendations to us fit with our policies and procedures, we will see about implementing them”. He also advised that corruption must be fought everywhere from the bottom level of Liberians to the top. Among those interviewed by the media at the demonstration included market women. An old woman when asked why she risked her health or life to participate in the hunger strike expressed of corruption and poverty in Liberia. 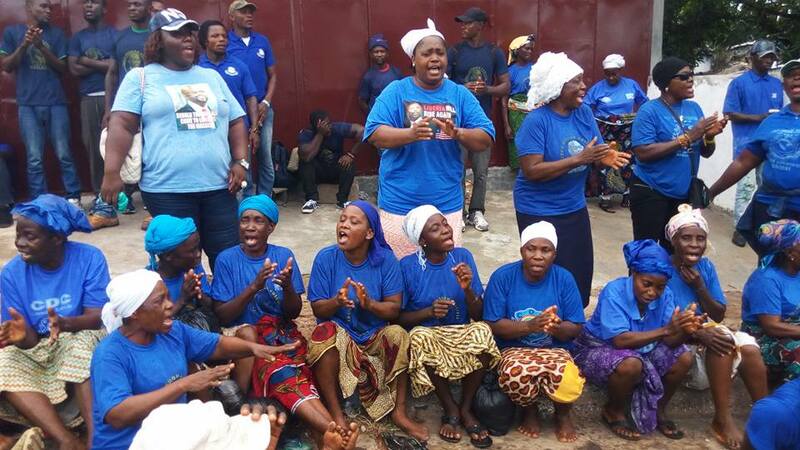 Other women spoke of their conditions, including the inability to pay their children school fees and other impacts of corruption in the country. To all the demonstrators, the hunger strike was worthy. They achieve their goal to physically bring the plight of the people to the doorsteps of the embassy of the most powerful nation of the world. Why did the strikers take the demonstration to the embassy and not to the Liberian legislature? Corruption has been around in Liberia for a longtime. The president first called it enemy number one and recently a vampire. Former Auditor General John Morlu has stated that the Sirleaf government is the most corrupt administration in Liberian history. In all cases of corruption in the government, only one official has been prosecuted and jailed. Most accused have gone scout free. The LACC and the Justice Ministry have been ineffective in prosecuting corruption cases. The government receives most of its revenues from international entities, including the US government or agencies. International partners have played an important role and are influential in Liberia. Although as a virtue of sovereignty, a foreign country cannot interfere in Liberian domestic affairs, Liberia listens to the US. Besides financial dependency, Liberia looks up to the US for the government professional manpower. Most Liberians in the Diasporas are in the US and many Liberian born US citizens are said to be working in the government. Because some domestic approaches seemed unworkable, some observers think that involving international entity in national issue would be an effective strategy. Let’s look at the CDC hunger strike analytically. Some Liberians view the exercise useless, a waste of time. Well, this approach is relatively foreign in Liberia, but it is very effective in the Western World, i.e. in the US. 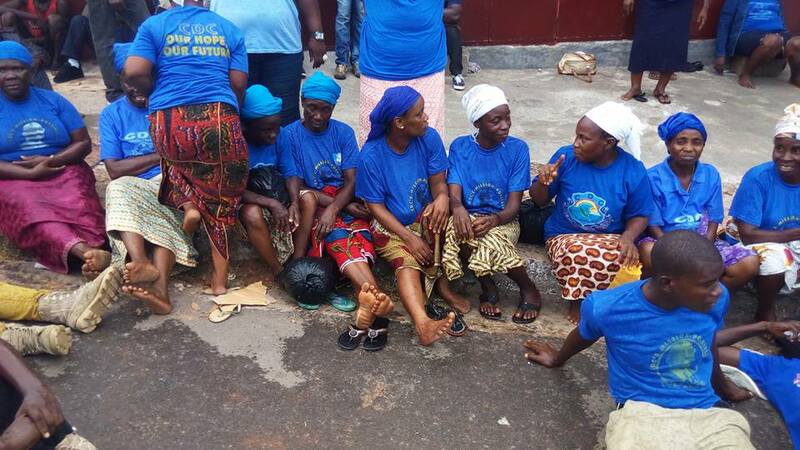 In the past some Liberians have gone on hunger strike for a cause. In June 2001, over 50 Liberian youths of the West African Youth Network for Peace staged a hunger strike in front of the Guinea Embassy in Monrovia, Liberia to protect the fighting at the Liberian, Guinean and Sierra Leonean borders. Moreover, In August 2013, Editor Rodney Sieh of the Frontpage Africa newspaper staged a hunger strike during his imprisonment for failure to pay a US $1.6 million label sue filed by Chris Toe, former Minister of Agriculture. Sieh had reported on corruption, which was said to have involved the minister. Regarding the CDC hunger strike, however, Sieh questioned its purpose on a radio talk show. Though undertaking hunger strike is a health risk, some civil and human rights advocates have used it successfully. It is a personal and physical sacrifice to bring to attention a national concern. People listen when that is done. It is like making a personal sacrifice of what is dear to us, such as food and water. When we ask God for help in an important matter, we fast and often God hears and answers. Though in the CDC case, the exercise is hunger strike, like fasting, they carry a common purpose of making a personal and physical sacrifice, which often gets the intended result. However, one should be cognizant of the society and environment where the hunger strike is to be conducted, as some institutions and individuals may see such exercise as nonsense. The political affairs officer of the embassy came out and met with the group. He would not have come out had the group acted disorderly, shouting and disturbing public peace and security. He came because the embassy realized that the group made a physical sacrifice of staying in front of the embassy for three days and nights without food and water; they stayed in the rain and sun and did not disappear or get discouraged. That was determination; that was sacrifice. The embassy watched them for those three days and its representative met with them at the end of the strike. What he told them was important, that their recommendations would be considered by Washington for implementation. Their message received an audience. That was an achievement. Because of security concern, US embassies around the world are security conscious, especially since 911. The embassy knew of the planning of the hunger strike, because the event was announced days ahead. The embassy would have used its power and influence to disallow the occasion, if it felt the exercise would create a security problem. The embassy would have also discouraged the event if it did not believe in the event purpose. Why did the political affairs officer and not the ambassador meet with the group? A political affairs officer, sometime called political officer, in an embassy is not a small potato. He or she is very important. He/she can act in place of the ambassador. In some embassies a political officer carries the rank of first secretary, deputy ambassador or minister-counselor. A political officer’s duties include analyzing the political conditions of the host country and preparing a weekly or monthly report for the ambassador for submission to the state department or foreign ministry of the home country. He/she is the ambassador’s “eyes and ears” and advises the embassy on political affairs. Because ambassadors are busy and are personal representatives of the home president, some ambassadors can send their report or communication directly to the president. With the input of the foreign minister/secretary of state and sometimes other aids, the ambassadors’ reports set the basis for the country’s foreign policy or view toward the host country. Hence when the political affairs officer told the group that Washington would consider implementing their recommendations, the “country team”, I mean the key staff of the embassy has already discussed the corruption issue in Liberia and has formulated a view, which will be discussed at the higher level at home for an official position. The US Assistant Secretary for African Affairs, Ambassador Linda Greenfield, recently visited Liberia and made some statements on corruption. Her observations on situation during her visit would be considered. The CDC group’s exercise would add weight to the embassy view of the seriousness of the average Liberian regarding corruption in Liberia. Before an official position is publically known, it would take some time, involving diplomatic communication or discussion with the Liberian president and possibly with other important international partners regarding Liberia.